Now, we’re not saying there’s anything wrong with a classic Victoria sponge – we’re quite the enthusiastic advocates, in fact – but we like to push the baking boundaries now and again with ever more unique and imaginative bakes, so our Buyer Veronica, a keen baker herself, seeks out marvellous bakeware specially designed to make it really easy for you to get creative with your cakes. 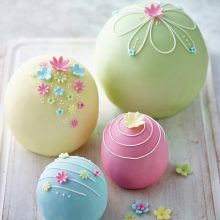 Whether you want to build gravity-defying cakes, create tiers of joy with impressively stacked celebration creations, or bake a perfectly smooth spherical sponge, Veronica has discovered the tin for the task. There’s nothing ‘novelty’ about these original, innovative tins though – we won’t ever compromise on quality, and demand the same performance, value and standards that we apply to our own ranges. Surprising bakes aren’t always about complicated creations – sometimes, little tweaks to your bakeware can transform a classic recipe into a stop-you-in-your-tracks ‘wow’ one. Take the Fillables Fluted Ring Cake for example – this ingenious set of tins bakes an attractive, decorative ring cake that is so much more than it first appears to be… The sponge is baked with little wells inside, ready to be filled with chocolates, sweeties or fruit when it’s cooled so, when it’s sliced and served, each portion has a pocket of loveliness hidden inside. Add mixture to both halves, bake, then fill the pockets in the base with whatever treats you fancy – jelly beans, chocolates, sweets or maybe jam. To hide your treats, cover with buttercream or frosting, add the second cake layer and decorate. When it’s time to slice and serve, the scalloped edges act as a cutting guide so you can be sure each piece contains a treat. 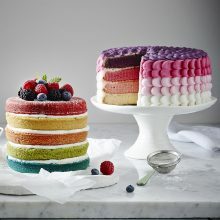 Have you seen those beautiful layered ombre cakes, with stacked sponges in rainbow shades? Wondered how to make one? Long before the craze for these colourful bakes took off, Veronica turned to cake decorating experts Wilton for a tin to make the process incredibly simple. Normally, to make a layered cake like this, you’d have to whip up various batches of mix and bake each layer separately, but Wilton’s Easy Layer Cake Pan Sets allow you to bake layer upon layer of loveliness in a single session, all fitting in the oven at once. Easy peasy! And we can highly recommend a stripy slice of Ombre Cake with Butter Caramel Frosting… delicious! Another corker from Wilton is their Chequered Cake Pan sets – an easy way to add creativity and fun to your cakes, each set lets you layer up countless chequered colour combinations for a truly bespoke treat. Just bake, stack, decorate, slice… and wait for everyone to ask, “How on earth did you do that?”. We simply don’t sell your basic sandwich tin… even the essentials in our Lakeland Bakeware Range have been meticulously considered to raise them head and shoulders above any others, and Veronica has sought out equally impressive bakeware so creating classic bakes – with a twist – is easier than ever. 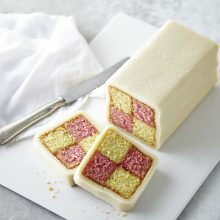 Take Silverwood’s Battenberg Tin – a true classic come afternoon tea, this colourful cake puts a smile on everyone’s face. Silverwood’s tin keeps the different coloured sponges separate and means you don’t have to mess about cutting them to size, just sandwich the strips together and wrap that yummy marzipan round for perfect better-than-shop-bought results. The flat-pack Silverwood Multi-Size Foldaway Cake Pan is equally as clever, with removable, repositionable dividers that lets you bake multiple cakes, from 3 to 30cm – all in one tin! Want to create a jaw-dropping 3D showstopper? Try making one that appears to defy gravity… We know our customers love to challenge themselves and create increasingly extraordinary bakes, and our Anti-Gravity Cake Kits let you do just that. 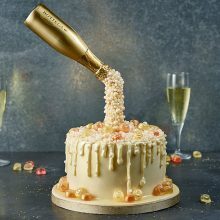 Makes the seemingly impossible possible, pouring or ‘floating’ cakes, all suspended as if by magic in mid-air. Specially designed to provide invisible support to multi-tiered or spherical baking creations, all the kits’ components are reusable, fit seamlessly together and can be used in any number of ways to give you even greater creative freedom. 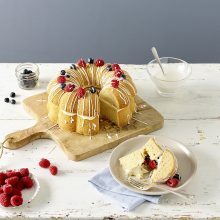 Previously only achievable with lots of stacking and precarious carving, perfectly round globes of cakes can be yours, as simply as baking in our Hemisphere Cake Pans. Single halves make perfect bunny or ladybird cakes, and by baking two halves and putting them together, you can expect friends to praise your ‘expertise’ as they marvel at your completely spherical football cake, princess carriage, magical unicorn… or any other cake you dream up! So much fun, and so simple, we really can’t wait to see the creations you come up with. As well as creating, developing and searching for baking products to fulfil the ideas she dreams up herself, Veronica always keeps an eye out for the ‘next big thing’. She’s the first to hear about upcoming baking trends and is continuously on the lookout for the tins and pans to keep you ahead of the baking game, as well as the ones on your ‘wish list’. If you’ve had an idea for a bit of creative cookware, or have been desperately trying to achieve an extravagant, fanciful or whimsical design but haven’t found the right kit, please do get in touch – you can email us, or reach us on Facebook, Instagram or Twitter – and we’ll pass all your lovely ideas on to our Buying Team. Happy baking, you creative lot! SPECIALISTS IN BAKEWAREWhy buy a Dry:Soon heated airer?